Throughout the months of January and February the sun has been slowly drifting northward in the sky. At 2:58 p.m. PDT on Wednesday, March 20, it will reach the celestial equator as the season changes from winter to spring in the Northern Hemisphere. The event is known as the vernal equinox and results in roughly equal amounts of daylight and darkness in a 24-hour period. Besides bringing with it the prospect of warmer weather, spring signals changes in the night sky as well, providing a new set of constellations to observe. The three most prominent constellations of spring are Leo, Ursa Major and Virgo. Leo the Lion is a highly recognizable constellation, as it is one of the few stellar groupings that resemble its namesake. The backwards question mark denotes its head and mane while a roughly right-triangle farther to the east marks the cat's hindquarters. It lies between Cancer and Virgo. Regulus is the constellation's brightest star (and is the 21st-brightest star in the sky), which represents the animal's heart. Leo contains a number of fine deep-sky objects, five of which are in Messier's catalog, namely M65, M66, M95, M96 and M105, all of them galaxies. Ursa Major, or Great Bear, is the third-largest constellation in the sky, spanning an area on the celestial sphere of 1,280 square degrees. Its brightest stars form the well-known asterism the Big Dipper, which is circumpolar (never sets) from our latitude. 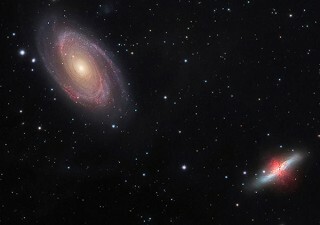 There are a number of showpiece objects in this area of the sky, but two of the finest are M81 and M82, both bright galaxies that lie relatively close together in space. Located about 12-million light-years from the earth, amateur astronomers sometimes refer to them as "the pair in the bear." Virgo is represented by a virgin, which symbolized fertility in many early cultures. It is a Zodiac constellation sandwiched between Leo to the west and Libra to its east. Virgo has a considerably larger number of notable features that can be seen in a backyard telescope. This is due in part because it is the second-largest constellation in the sky, holding an area of 1,294 square degrees of sky. Spica, the constellation's most luminous star, is the 16th-brightest star in the sky and can quickly be found by tracing the arc of the Big Dipper's handle. Together with the neighboring constellation of Coma Berenices, Virgo is home to the brightest group of galaxies in the sky, known as the Virgo Cluster, which contains well over 1,000 individual galaxies. Some of the more prominent of these include M49, M58, M59, M60, M61, M84, M86, M87 - the supergiant elliptical galaxy - and M104, the Sombrero galaxy. Virgo is also home to 35 verified exoplanets orbiting 29 stars. In planning observing sessions, it's best to avoid a bright moon. Skies are darkest early in the month, a few days either side of new moon on March 6. By March 14 the first quarter phase brightens the sky considerably, and on March 20 a full, super Worm Moon completely overwhelms the night sky. It's a super moon because the moon's distance is at least 90 percent of perigee, the closest distance to the earth. Native Americans named the March full moon the Worm Moon because by spring the ground begins to soften and worm castings reappear, inviting the return of robins. The moon reaches last quarter on March 27 and is well out of the way for evening observing. So, make sure to grab some hot cocoa, a blanket, and some friends and go out to look at the night sky and see if you can identify some springtime constellations.